Recently there has been a shift from laptops with many ports, to laptops very few ports. The USB-C port has prevailed across many brands and is used in some of the most popular laptops like the MacBook Pros or Dell’s latest XPS 13. Many may agree that that less ports on a laptop has a sleek appeal. But what do you do if you still need some ports such as: USB, HDMI, Ethernet, headphone jacks, DisplayPort, Micro SD/TF, and SD card slots? Do you buy a hub for each port? It will surely be difficult to keep track of them all. And what if you want to use multiple hubs at the same time? That is a whole new problem that occurs with new laptops in the market today. Tronsmart has found an all in one solution for these problems. 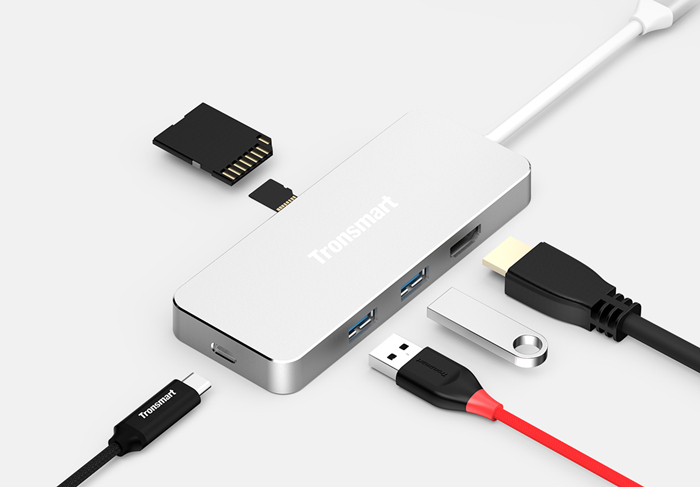 The Tronsmart CTHA1 is a 6-in-1 USB Type-C hub that will always keep your device connected. While the CTHA1 gives you all the ports you need, it is also compact and lightweight; so you can conveniently take it along wherever you go. 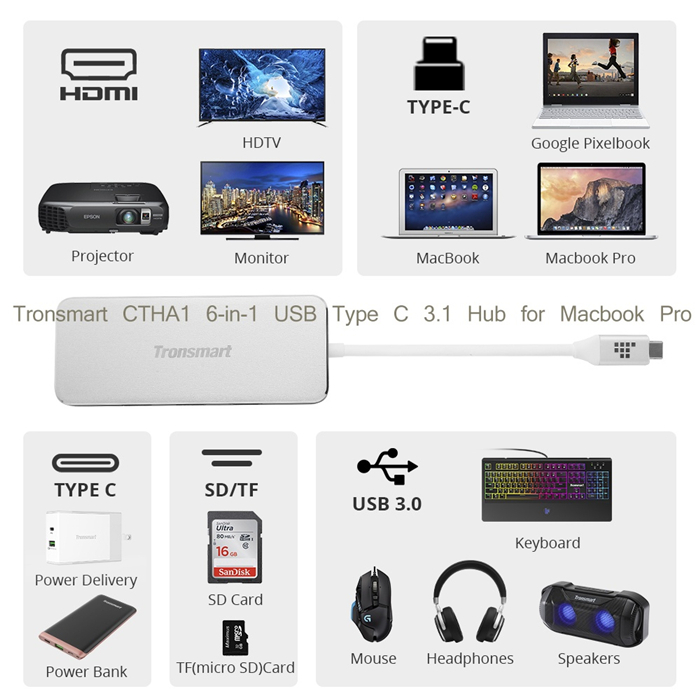 First and most importantly, the CTHA1 6-in-1 hub flat out offers the best port selection: with two USB 3.0 ports, HDMI (4K), Micro SD/TF and SD card slots, along with a USB-C port offering a maximum of 60W power pass-through via Power Delivery technology. It has a single compact aluminum alloy housing to reduce electromagnetic interference while managing not to take up much space in your bag or on your desk. The port layout is also one of the best designs on the market, with a single built-in USB-C cable that plugs into a computer on one end, and has a USB-C output on the back for charging. One side features the Micro SD/TF and SD card slots, while the other has two USB-A 3.0 jacks and one HDMI port. Everything is spaced far enough apart to still easily plug things in, which is an issue with many large plugs. 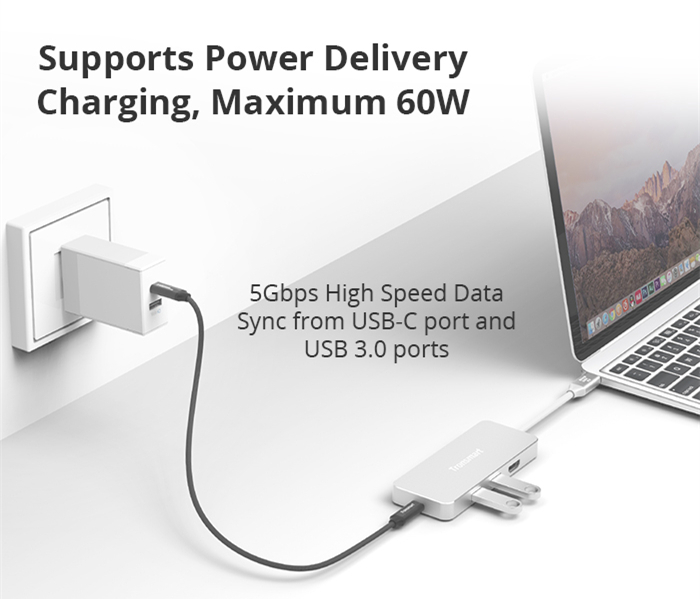 This Hub is compatible with most USB-C laptops/notebooks such as Apple’s MacBook/MacBook Pro, Google Pixelbook, Samsung Chromebook Pro, and USB-C Notebooks manufactured by Dell, LG, HP, Asus, Acer, Huawei, Xiaomi, etc. 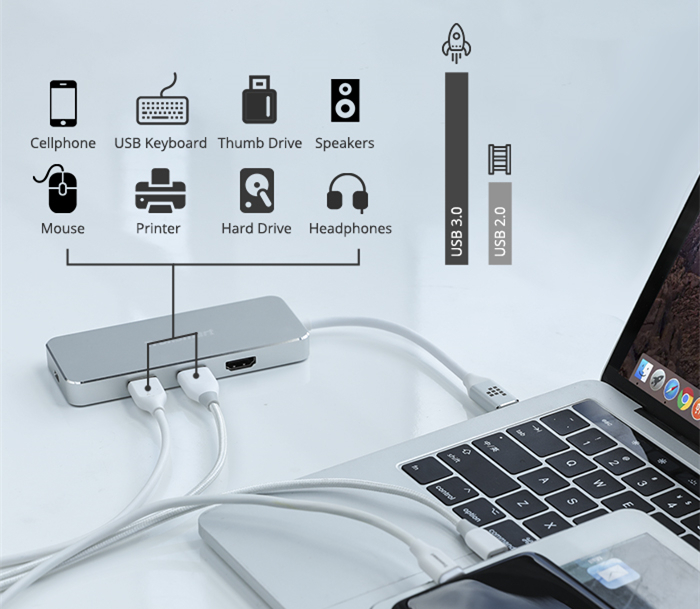 With the CTHA1 you can charge your laptops or other USB-C devices while connecting multiple peripherals for data transfer via USB-C port as well as the 2 USB 3.0 ports. The data transfer using the USB ports can transfer up to 5Gbps, which is faster than the majority of other devices that transfer only 480Mbps. On top of all this, the CTHA1 Hub also supports 4K HDMI video output at 30Hz and 1080P output at 60Hz. It’s a great tool to mirror your laptop screen on a larger TV, PC monitors or projectors, to demonstrate PPT, enjoy movies, photographs, videos, and more. It also features one SD card slot, one TF/Micro SD card slot, completely driver-less on both PC and Mac, enables you to turn the laptop into a creation station, shoot, ingest, edit footage anywhere you want, even in non-WiFi environments. 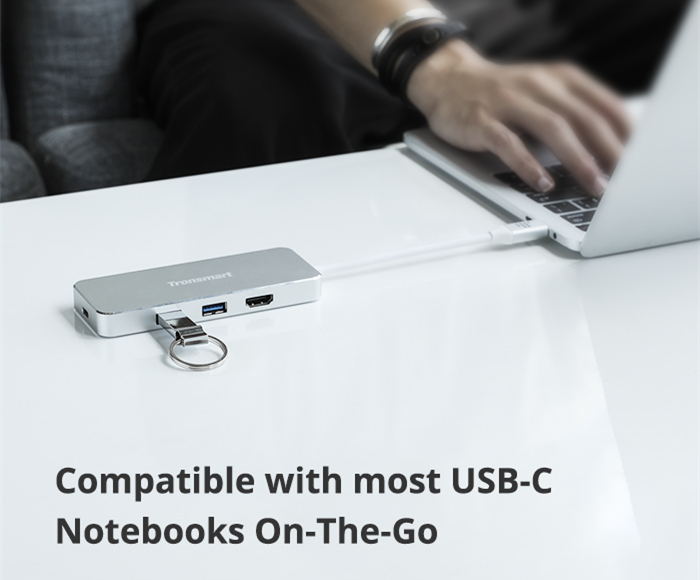 Simply plug SD or TF/Micro card into the hub and then connect the hub to your notebook and you’re ready to go.